Arsenal could be without Mathieu Debuchy for a lengthy period after he sprained an ankle during Saturday's 2-2 draw with Manchester City. 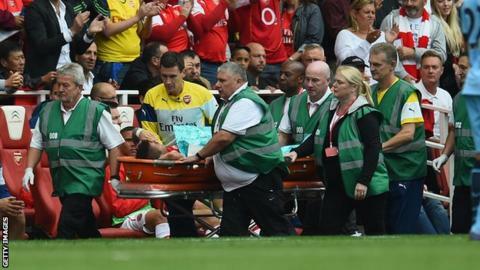 The France right-back, 29, was given oxygen and carried off on a stretcher after his ankle buckled following an 81st-minute header in the Premier League match at Emirates Stadium. "It doesn't look too good," said Gunners manager Arsene Wenger. "They need more time to assess it, but it's a bad sprain." Debuchy, who appeared to be in considerable distress, joined Arsenal from Newcastle in July.